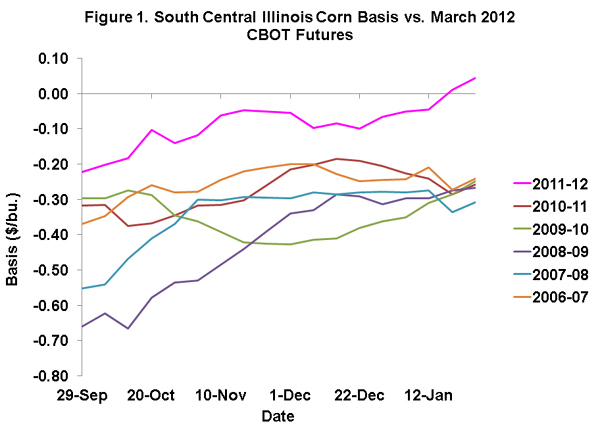 Now, three months later, we find the corn basis is even stronger than in October and at record levels in some markets. Figure 1 illustrates the magnitude of the average basis at country elevators in South Central Illinois each Thursday from late September through late January for the past 6 years. The cash price used in the calculation is the overnight bid as reported by the USDA’s Agricultural Marketing Service and the futures price is the settlement price of the March futures contract. Since October 20, 2011 the basis has strengthened by $0.15 and stood at a record $.05 on January 26, 2012. In the previous 37 years for which we have data, the average cash price in this area had not ever been above the nearby futures price on this date. Some have argued that the small crop of 2011 and ample storage space has uniquely allowed farmers to easily store the crop requiring a strong basis to motivate additional sales. That explanation alone is not sufficient to explain the strength in the basis. By that logic soybean basis, for example, would also be record strong, but it is not. In addition, storage space is always in surplus in the middle of the marketing year so that this year is not unique in that regard. Farmers may be tight holders of the 2011 crop, but the tightness is not just the result of them having capacity to store the crop. Nor is it due to a “shortage” of physical inventories of corn–at least 9 billion bushels of corn were in storage as of December 1, 2011. So, if there are so many bushels of corn in storage what accounts for the continuation of the very strong basis? It is useful to step back and consider the basic economic function of the basis. The “job” of the basis is to send the appropriate signals through the marketing year so that an adequate amount of corn is in storage at the end of the year since there is usually a gap before the next harvest becomes available. From this perspective, basis levels should be strong when the flow of corn to the market is slow relative to the pace of consumption. The tightness in supplies available to the market, then, results in a strong basis that reduces the potential returns to storage and coaxes more sales by farmers or others who are holding stocks. Tightness in supplies available to the market may be the result of a reluctance of farmers and others to sell corn, a very rapid pace of consumption, or some combination of the two. It is unusual for tightness to persist for long periods of time as it apparently has this year. The contribution of each factor (slow selling and strong demand) to the recent basis strength is difficult to discern. If farmers have been more reluctant than normal to sell corn inventories, it may be that they have perceived corn prices to be undervalued following the sharp break in prices from the late August 2011 peak. Demand strength should be reflected in the rate of consumption. Corn is consumed in three major categories: exports, ethanol and co-product production, and feed. The pace of exports and the pace of ethanol production are very transparent, with data reported on a weekly basis. The pace of exports this year has not been unusually rapid, with shipments to date about equal those of a year ago. The pace of ethanol production was very rapid from mid-November 2011 through mid-January 2012, exceeding the pace of a year ago by 4 percent. The pace slowed a bit in the third week of January. The rapid pace of corn consumption for ethanol production may have contributed to the very strong basis this year. The pace of feed use is not very transparent and is calculated as “feed and residual” use on a quarterly basis following the release of the USDA’s quarterly corn stocks estimates. The calculated rate of feed and residual use of corn was unusually low during each of the final two quarters of the 2010-11 marketing year and the first quarter of the current marketing year. 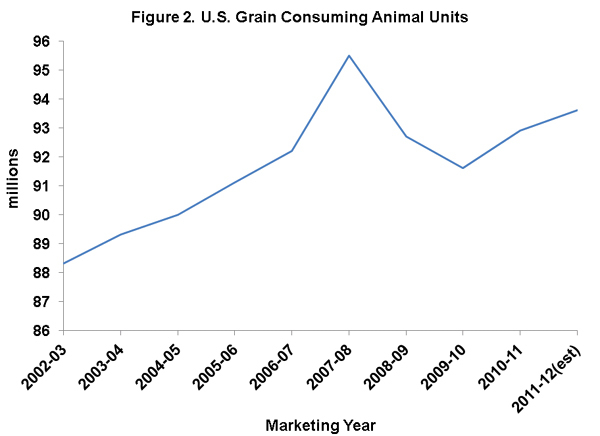 The low rate of feed and residual use appears to be at odds with the increase in the USDA’s estimated number of Grain Consuming Animal Units (Figure 2) in the 2010-11 and 2011-12 marketing years and the level of feeding of other grains, oilseed meals, and by-products (including an estimate of distillers grains). The implied rate of total feed consumption per animal unit has declined sharply. The continuation of the extremely strong corn basis over a relatively long period of time suggests that the rate of feed and residual use of corn may have been more rapid than implied by the recent quarterly stocks estimates. That scenario would imply that recent stock levels have been over-estimated and that stocks at the end of the year will be smaller than currently forecast (see previous posts here and here for more detailed discussions about the grain stocks report). That scenario would be a convenient explanation for both the strong basis and the apparent under-valuation of corn futures prices. Judging by the magnitude of the current basis compared to normal levels, futures prices may be under-valued by about $.30. If feed and residual use of corn has been under-estimated in recent quarters, one would hope the under-estimate is revealed in future quarterly stocks estimates from the USDA. There is clearly much more than the normal uncertainty about the accuracy of these estimates. Such uncertainty will make it difficult to anticipate the level of reported stocks for several more quarters. Undoubtedly, further bumps ahead. Corn Price Swings to Continue? The Historic Pattern of U.S Corn Yields, Any Implications for 2012?